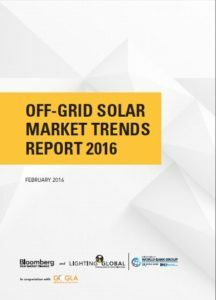 A lively read for companies, investors, governments, and other key players interested in the opportunities and challenges presented by the dynamic off-grid solar market. The report tracks the groundbreaking technological advances and innovative business models which have emerged to transform the lives of millions through affordable modern solar energy services. This is the third in a series produced by the World Bank Group’s Lighting Global Program since the young industry’s emergence seven years ago. Written in collaboration with Bloomberg New Energy Finance, and in cooperation with the Global Off-Grid Lighting Association, the report provides a comprehensive view of the state of one of the most impactful sectors in the global economy today.